Mon, Apr 15, 2019, 09:34 pm SL Time, ColomboPage News Desk, Sri Lanka. The Prime Minister who arrived at the Bambarakele Sri Maha Viharaya this morning met the Chief Incumbent of the temple Ven. Meepanawe Sugathananda Thero. After the religious observances the Prime Minister received blessings for the New Year. 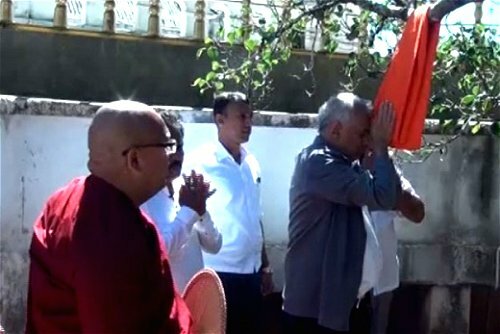 The Maha Sangha blessed the Prime Minister and the country. During the visit, the Chief Incumbent of the temple briefed the Prime Minister on the problems of the people of Nuwara Eliya. The Thero pointing out that any country is developed by agriculture asked the Prime Minister to implement a program to strengthen the agriculture in the country. The Chief Incumbent Thero also noted that the Nuwara Eliya general hospital under construction has not been opened yet and requested the Premier to expedite the opening of the hospital.